In one sense the Sculpture on the Edge Exhibition advertised in the flyer below is not really placemaking art in the purest sense but in a broader sense it is. 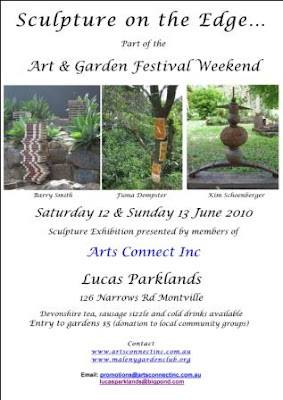 A bunch of Arts Connect and ArtSite artists (about 15 artists in all) are creating sculptural art for places. In the exhibition these art pieces will be in the Lucas Parklands garden and associated rain forest walk; but the art could also be just as well suited to public and community places. The artists have accepted the challenge to create new works and installations (some ephemeral and some that can be moved to other locations) that reflect the forest and the special features of the forest walk. Many of the works will be comments on aspects of the place and aim to communicate that to visitors.